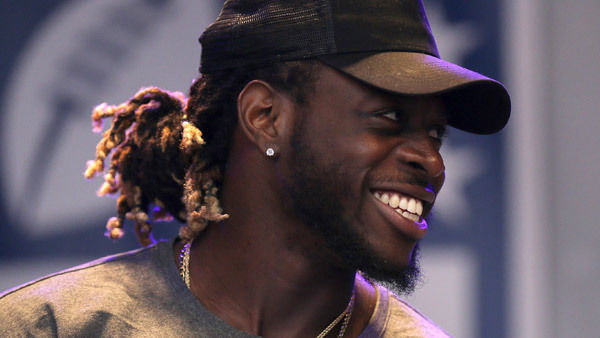 PHILADELPHIA (WPVI) -- The Philadelphia Eagles have acquired running back Jay Ajayi from the Miami Dolphins in exchange for a 2018 fourth-round pick. The Eagles made the announcement on Tuesday. The NFL trade deadline is 4 p.m.
Ajayi has rushed 138 times for 465 yards (3.4 average) over seven games for the Dolphins this season. He is coming off a big 2016 campaign in which he racked up over 1,200 yards 4.9 average) with eight touchdowns. He has yet to score a touchdown this season -- the most rushing attempts in the league for a player yet to find the end zone.The Dolphins are the first team since the 2013 Rams to not have a rushing touchdown in their first seven games, and the team's streak of eight straight games without a rushing touchdown is a franchise record. The Eagles have been aggressively working the phones prior to the trade deadline. One of the targets was a running back. A need developed for a third-down back in particular after Darren Sproles was lost for the season. "Welcome to Philly, #JayTrain!" the Eagles tweeted. Ajayi was born in London, England. He was drafted in the fifth round of the 2015 NFL Draft by the Dolphins. In 2016, Ajayi earned a Pro Bowl berth after finishing fourth in the NFL with 1,272 rushing yards, marking the third-highest single-season total in Dolphins' history. The Eagles currently have a 7-1 record and are in first place of the NFC East.